Cover of Jerusalem (Ebury Publishing, RRP £27). Reproduced by permission. Yotam Ottolenghi and Sami Tamimi met in 1997. Tamimi was then the chef at Baker & Spice, a bakery and retail food shop in London. Ottolenghi, an aspiring pastry chef, walked in looking for a job and they quickly became close friends. They have been working together ever since. When Ottolenghi opened his eponymous deli/gourmet store five years later, Tamimi joined him as a partner. Together they have opened four shops and a restaurant, and have written two books, Ottolenghi and Jerusalem. (Ottolenghi has also written another book, Plenty, on his own.) "It's like a love story," Ottolenghi joked on KCRW's radio show Good Food. The two are not, in fact, lovers. They're more like brothers, maybe even twins. They were both born in Jerusalem in 1968. Both then moved to Tel Aviv, in part to escape Jerusalem's conservatism, and both immigrated to England in the same year. Because one is Jewish and the other Palestinian-Muslim, there has been an irresistible desire on the part of observers, journalists, and foodies alike to see the two as poster boys for peace. But the two men resist this move. According to Ottolenghi, "we did resist it for a very long time and I think the problem that Sami and I always felt is that, especially since Jerusalem came out, people wanted to use our example as a sign that something is possible in the Middle East … It's almost intimidating to feel that you kind of carry this on your shoulders, that we are the example of coexistence, because we know how untrue that is deep inside." The two embrace being a bit rebellious. 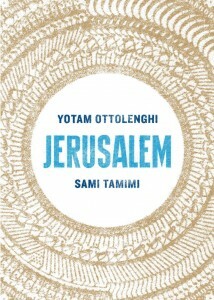 "Sami is not a typical Palestinian, I am not a typical Jew," says Ottolenghi. The first recipe in their first book includes pork and they initially wanted the book cover for Jerusalem to be to a photograph of a shrimp dish. Ottolenghi is not a Middle Eastern cookbook, and the authors do not call their food New Israeli Cuisine. Yes, they use lots of tahini and pomegranates, but there are also recipes in the book that could be described as Asian, Italian, and even American (Roasted Sweet Potato with Pecan and Maple) There is also nothing overtly Jewish about this food. Their cookery is focused on bold, sensual flavors above all else. You will find no foams or spherification here, just good, simple cooking using lots of garlic, lemon, and spices. Their mission is to bring the pleasure of their food to as many people as possible. Until recently Ottolenghi and Tamimi had largely avoided the politics of Israel/ Palestine. Their latest book, Jerusalem, however, is another matter. It is political, almost against their wills. It is not intended as an exhaustive study of the city's food but is instead a nostalgic recounting of their food experiences and memories. They themselves call it self-indulgent. Nostalgia, of course, is a form of remembering and forgetting; as such, it cannot be apolitical. The authors are clearly aware of this. In their first book they wrote, "Looking back now, we realize how extremely different our childhood experiences were and yet how often they converged—physically, when venturing out to the 'other side,' and spiritually, sharing sensation of a place and time." But one questions if they really shared a place and time at all? In Jerusalem they astutely note that the city has been "at the heart of the struggle between these two fierce nationalistic movements," each of which has constructed its own historical narrative. Of the 1948 War they say, "for the Jews it is the War of Independence, an assertive act of bravery after the trauma of the holocaust; for Arabs, however, it is called a nakba, 'the catastrophe.'" They say little, however, about the 1967 War, an event that must have had an even greater impact on their lives. Again, the collective memories of the Jewish and Palestinian communities are quite divergent. For Israeli Jews this was a miraculous victory, for Palestinians a traumatic loss. According to Dana Hercbergs: "The interplay between one nation's victory and another's loss shapes Jerusalemites' personal narratives about their childhood past, although the local dimension and the tendency to view childhood as a positive time complicate the dualistic perspectives that the national narratives seem to suggest." Indeed, both Ottolenghi and Tamimi express a fond nostalgia for the city of their youth, but their experiences, and those of their families and communities, must have been quite different. For Israeli Jews, the reunification of Jerusalem meant access to the Old City and the reconstruction of the Jewish Quarter; for Palestinians it meant the demolition of the Moroccan Quarter and a series of land expropriations. Overnight, Arabs in East Jerusalem became a "minority" community in a country established on the basis of Jewish hegemony. "Venturing out to the 'other side'" for an Arab and a Jew could not have been the same. For the Arab side, the experience was colonial. In fact, it is hard not to see Jewish culinary tourism in East Jerusalem as a paradigmatic case of Heldke's "cultural food colonialism." Even when eating out is a well-intentioned and respectful attempt to learn more about another culture, it is at the same time "motivated by a deep desire to have contact with, and to somehow own an experience of, an Exotic Other." Food colonialism also involves the appropriation of culinary practices by those in power. Food ownership is a hot button issue in Israel/Palestine. Ottolenghi and Tamimi address this issue head on, though in ambivalent ways. They resist ownership and authenticity on the grounds that it is impossible to determine who invented a dish. Instead they focus on Jerusalem as a site of culinary interaction and overlap. This is perhaps natural since many of the "Jewish" recipes in their book are Middle Eastern or Sephardic. These often bear quite a resemblance to Palestinian foods. At the same time, their mejadra recipe could easily appear in Poopa Dweck's book on Syrian Jewish cuisine. On the other hand, they point out that the herb za atar is a Palestinian ingredient that the Israeli government has declared an endangered species and has banned collecting in the wild. This occurred without any dialogue with the Palestinian population. More recently, in a conversation with the authors of The Gaza Kitchen, Ottolenghi said that if he were to rewrite Jerusalem, he would take the question of appropriation and ownership more seriously. "I probably would have made the point that it's very hard to say who is the originator of each dish, but it's also overwhelmingly true that some of those dishes are the symbols of the Palestinian culture, and as such they just cannot become everybody's sign of culture or identity. That the sign of an identity is a bit more crucial than just getting the history right of a certain dish." It is, of course, impossible to write a book on the food of Jerusalem without being political. Something as seemingly mundane as the name of an ingredient can be a contentious landmine—maftoul, Israeli couscous, ptitim, moghrabieh and even fregola are all remarkably similar. But a name is never just a name. Culinary terminology, like the renaming of villages or immigrant name changing, is about power. Ottolenghi and Tamimi maneuver this treacherous field as well as can be expected. They are not politicians and claim to represent no one but themselves. They are far too sophisticated to believe that their partnership is a model for national reconciliation. They are asked repeatedly if food can help bring peace to the Middle East. Their answers are highly nuanced. They are not naive—food is not a magic bullet. On the other hand, real interaction between Jews and Arabs in Israel/Palestine is rare. Food markets and restaurants provide unique spaces of contact. Likewise, ingredients and dishes move from one community to another. So maybe food can be a first step. It might be our only hope. "Food probably could be a vehicle to bring people closer together," Ottolenghi says, "the next step will have to transcend food." Ari Ariel is lecturer in Middle Eastern History at Bryn Mawr College and is the author of Jewish-Muslim Relations and Migration from Yemen to Palestine in the Late Nineteenth and Twentieth Centuries (Brill, 2014).